Gold Military Rings custom made for active and retired military personnel. Throughout history gold has been used to enhance beauty and display wealth. Formerly gold jewelry was worn only by royalty and noblemen as an exhibit of their wealth and power. In more recent times it has become accessible to the common man through the technologies of alloys and plating. Although the value of gold rises and falls over the short term, its limited quantity in the world assures that its value will continue to go up over the long term. Gold military rings have been kept as an investment for centuries for members of the armed forces worldwide. Women have hidden away their gold jewelry in the event of their husbands’ demise or inability to provide. Wealthy investors have collected gold, melted it into bars and secreted it in strongholds until the price rose. Gold jewelry’s value is determined by a couple factors. The first is the skill and reputation of the designer. The second is the actual amount of gold used in creating gold military rings. Gold is a very soft metal. If pure gold is used in jewelry, it would dent and scratch very easily during the course of a normal day of wear. Therefore, gold is usually mixed with harder metals before being fashioned into jewelry. Colored gold is made by mixing gold with other metals. White gold is derived from gold mixed with palladium or nickel. Rose gold is made by adding copper to gold. A greenish tint can be obtained by adding white silver. Attractive braids and other intricate and beautiful patterns are achieved by using several tints in one piece of jewelry. Gold plating is the layering of gold over another metal. This gives the appearance of expensive gold jewelry without the expense. It’s real gold, but not solid; the gold doesn’t go all the way through, so it costs less. The biggest problem with gold plating is that it doesn’t last. With use the gold rubs away exposing the less valuable and less attractive base metal. It is often purposefully and deceptively sold as solid gold, so be sure not to get duped! Gold jewelry runs the gamut between small, delicate and reasonably priced, to big elaborate and impossibly expensive. 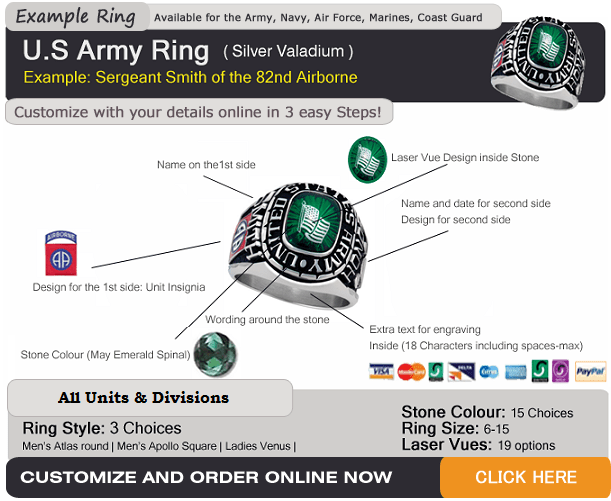 Find an affordable spot in that range and invest in some beautiful and valuable gold military rings. It will provide beauty when worn and increase in value at the same time plus you will create a master piece for a family heirloom.